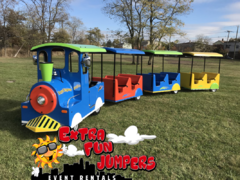 The trackless train are a great to up the wow factor at any event. 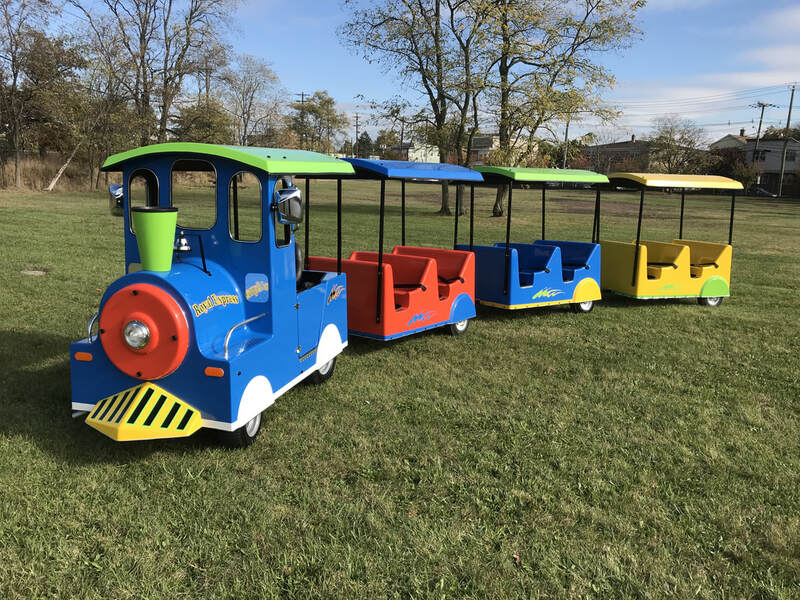 Our trackless train is loaded with lots of awesome feautures such as LED under lighting, complete sound system, train whistle, seatbelts and it has the capacity for 16-18 passengers, 6 children or 4 adults per coach, rides on hard surface or grass, it is able tu turn on a 18ft curb radius. Great for fall festival, corporate pic nics, and church gatherins! NOTE: Trackless Train can not be operated on slope, inclines or hills. under rain or winds over 25 mph. Up to 16 to 18 passengers, 6 children or 4 adults per coach. Entrance to set up area has to be at least 10ft in width. Trackless Train is transported with a truck, therefor the truck has to be able to enter where the Train will be install.